Inside the library, students will find a Team Lab, designed to support student collaboration and group projects. This room includes four computers with furniture arranged for group work, a whiteboard, and a shared printer. 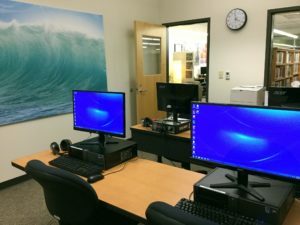 There are also two computers in the Library for students who wish to work individually without the distractions of a group setting. These computers have ergonomic keyboards and mice, 23-inch monitors, deluxe headphones, and a shared printer. These computers are available during open business hours. There is also a computer in each of the four individual study rooms, available any time the Study Rooms are open.